This article is a short summary of Mario Clock. A Screen Shot of Mario Clock. 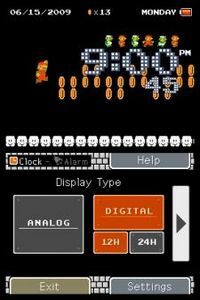 Mario Clock is a clock application based on Super Mario Bros., released for as DSiWare in January 2009 in Japan, and June and July for the rest of the world. For its release outside Japan the game was released alongside the companion application Mario Calculator. Turn back time and enjoy a bit of classic game play based on the original Super Mario Bros. with Mario Clock. Help Mario and Luigi collect more coins than ever (POW block anyone?) while they run through a variety of stages. Gather enough coins and you'll be treated to another scene bound to bring back fond memories for many. Mario Clock includes both analog and digital clocks that use the system's internal clock or allow you to offset the time however you like. Program up to three alarms (with snooze functionality for those that need it) and assign them a Mario-related sound or use one created in the Nintendo DSi™ Sound application. You'll find yourself thinking "Just a few more coins..." in no time! This page was last edited on 23 September 2016, at 19:35.